Quite honestly, this is one of the nicest vintage hardcopies I've come across. 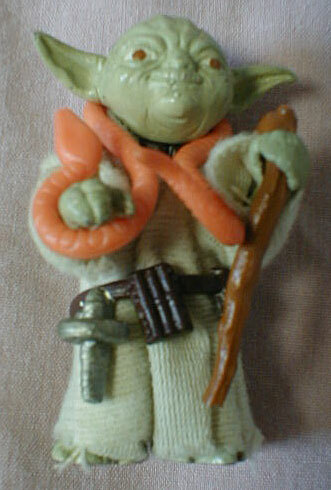 Not only is it beautifully crafted, it pertains to a great character-- Yoda. While it's hard to tell from this photo that the piece is not simply a standard production figure, trust me, you know when you hold it in your hand and feel its weight. It was likely used at an industry show like Toy Fair, or for promotional photography. I do not believe the limbs are moveable; they were probably simply glued onto the torso of the figure. The belt is also colored differently than is the production version. 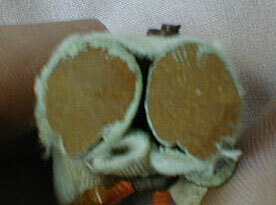 Here you see the bottoms of the figure's feet. The urethane used to cast this thing was brown in color. This casting product, which Kenner seems to have used prior to about 1981, is commonly referred to as Carbalon. It was later replaced by the green Dynacast, which seems to have been used almost exclusively until at least about 1986.